This article seeks to analyse some common trends and patterns observed in movie sequels and to study the influence of the first movie on the sequel making decision in the context of the American and the Indian film industry. It touches upon how brand extensions work in the film industry and to identify the key drivers behind sequel making decision. The analysis has been used to address the question if it would be strategic for the director of "Munnabhai", a popular movie series in Bollywood, to make a third sequel to the movie. The motion picture industry is one of the least explored of all creative industries. Given the highly unorganized nature of the industry and the state of flux it is constantly in, the extent of formal research on the behavior of this industry is very limited. A production house is like a venture capitalist firm that needs to identify the potential cash cows and make a strategic choice about where it wants to invest its money. The film maker and the movie crew have to identify the right projects to pool in their time and talent. One among the many strategic choices confronting them is the decision to undertake a sequel capitalizing on a potential blockbuster. It is an intriguing fact that sequel making in the film industry, though a popular practice in Hollywood is almost a dormant phenomenon in the Indian film industry. It is an intriguing fact that sequel making in the film industry, though a popular practice in Hollywood is almost a dormant phenomenon in the Indian film industry, the largest producer of films in the world. This article takes a step back and explores the very concept of brand extensions in the film industry, taking Hollywood as a benchmark. It seeks to identify the drivers behind a sequel making decision and the factors that determine its success. The analysis has then been extended to Bollywood to answer some intriguing questions about how good a business decision it would be to make a third movie in the Munnabhai series, a popular Bollywood comedy. Two classes of sequels can commonly be observed, namely character driven and theme-driven. The character driven movies include the Bourne Series, Home Alone and the Harry Potter series. Theme-driven movies include the Lord of the Rings movies, Pirates of the Caribbean, and Jurassic Park among others which provide the audience with an experience of a different world. These classes can further be divided into two sub-categories. Story-driven movies are chronological and usually based on books. To some extent it is a given that sequels to such movies would follow. The second category has at least one centralized character with independent stories. 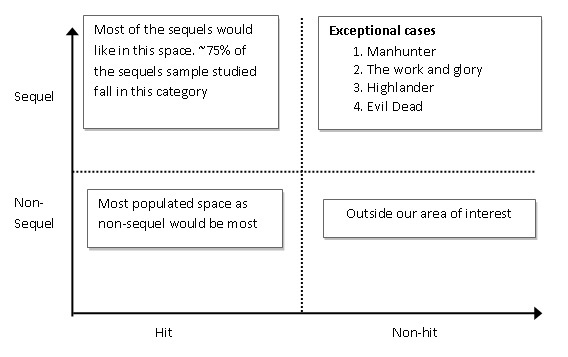 An initial hypothesis was that certain genres are more conducive for sequels than others. We performed an analysis of the genres of sequels in Hollywood to test this hypothesis. The data set consisted of a random sample of 50 sequel movies and their corresponding genre from the International Movie Data Base (IMDB). The results are shown in Exhibit 1. 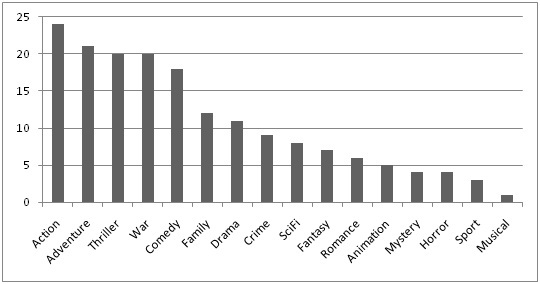 This analysis indicates that the prominent genres among Hollywood sequels are action, adventure and thriller. The popularity of these genres suggests that they capture the imagination of the audience and entertain wholesomely, which is the experience that the audience is seeking repetitively. Also these movies attract a huge fan following, which further promotes the movie and their obsession with it through blogs, communities in networking sites etc. Where, box office performance is either a bonus or a discount given based on the box office revenues collected by the movie in comparison to the inflation adjusted cut off for that year. The results of our analysis are shown in the sequel-hit matrix in Exhibit 2. While it was expected that the success of the first movie would have a significant influence on the sequel making decision, certain unexpected results can be seen in the second quadrant. This includes not so successful movies, which were however converted into sequels. A common pattern that can be observed among the movies in this space is that all of them have eccentric themes and do not follow the traditional standards of mainstream cinema as done by HighLander. This introduces us to a special class of cult cinema which can be called the "so-bad-they're good" movies. This introduces us to a special class of cult cinema which can be called the "so-bad-they're good" movies. These are typically low-budget films which may have a comic effect and would appeal to a small base of audience. According to literature on cult cinema by Pierre Bourdieu and Sara Thornton, cult cinema creates a sub-cultural ideology through which fan cultures produce a sense of identity through their supposed difference from the mainstream. This class of cult cinema would partially explain the existence of sequels based on not-so-successful parent movies. A character in a movie can be considered analogous to a brand in the market and a sequel can be considered to be its extension. Companies often launch extensions to their brands. The question which follows is when can a brand be considered suitable enough for it to be extended? Dennis Le Yohn, a brand consultant had proposed a model to measure the extensibility of a brand based on four dimensions2. We extend this model and propose a conceptual framework to measure the brand extensibility of a movie or a character in a movie. Symbolic vs. Literal - To find whether the character symbolizes a deep rooted ideal and is aspirational OR whether it conveys a literal message that is easy for the audience to imagine. Mysterious vs. Straightforward - To determine whether the movie has a story that is not fully known OR whether the movie has a story that is complete and the audience has a complete knowledge of the character. Key decision maker: The key decision maker in the process of sequel making is the production house which decides whether or not to greenlight3 the project. The production house may choose against investing money for a sequel. Key influencers: The cultural alliance and mutual relationship between the director and the crew act as the key influencers. The genre of the first film and the existence of the central character with depth for brand extensibility are equally important. We propose a three dimensional conceptual framework (Exhibit 3) to indicate the key factors which drive sequel making decision and the interaction amongst them. Creative Core: The genre of the movie, the identity of the brand and the depth of the lead characters form the creative core of the movie. Resource Base: Pre-existing literary assets, profits generated by first movie and resource generating capability of the studio constitute the resource base that provides a strong foundation for a sequel. Pattern of coupling: Existence of a movie franchise leads to long term contracts between the actors, directors and other members of the crew. In this model, an intellectual property involving the characters, settings and trademarks of the original work is created and whole series of films is made. The three dimensions discussed in the framework complement one another to create a system conducive to sequel making. A phenomenon called optimal distinctiveness is proposed in literature4 by Alvarez and Mazza. The paper argues that in a cinema field managing artistic pressure for distinctiveness versus business pressures for profits drives filmmaker's quest for optimal distinctiveness through both exclusive (unique style) and inclusive (audience appealing) artwork. Sequel classification in Bollywood is quite different, indicative of varied audience preferences. Character-driven roles were seen in Munnabhai MBBS and the sequel Lage Raho Munnabhai. This sequel had the emphasis on central character, with independent stories and different side actors in both movies. Theme-driven sequels are still missing in the Bollywood landscape. An interesting sequel type which has been widely identified in Bollywood is the de-facto sequel. Bollywood has been actor-centric and it's the character of the actor which has attracted the Indian audience. This was highly prominent when Amitabh Bachchan was titled the angry young man of Indian Cinema. When audience watched Shahrukh Khan in various romantic roles they actually watched the romantic, upper-middle class, value driven character in different movie plots and contexts, hence depicting de-facto characters. The dominance of these de-facto sequels in Bollywood has restricted the number and the variety of sequels. The de-facto sequels in Bollywood dominate any other form of movie. The paper proposes that it is the dominance of these de-facto sequels in Bollywood that have restricted the number and the variety of sequels in Bollywood. On the other hand, sequel making in Hollywood is heavily dominated by character-centric stories which make the brand extensions more pronounced. An assessment of the characters in the two industries, even though not conclusive is definitely suggestive towards the presence of more dynamic, mysterious and symbolic characters in Hollywood than those found in Bollywood. Further, the strong position held by one or more central characters is hard to miss in Hollywood. On the other hand, such strong characters are difficult to come by in Bollywood. De-facto sequels come closest to matching the popularity of stars in Hollywood. Based on the entire analysis, the possibility of the success of a sequel to Munnabhai III has been evaluated. An in-depth analysis of the resource base of the movie indicates very high profit generated for the first and the second movies of the Munnabhai series. Further, the resource capabilities of the production house- Vidhu Vinod Chopra Productions needs to be analyzed. The movies were comedies, a theme that is very popular with Indian audiences and hence gives it a strong creative core. Also, Munnabhai-the centralized character-driven sequel got identified as a major brand and an inspirational model for the audience. An essential requirement for the making of a third sequel to Munnabhai would be to add fresh elements to the genre and develop the character further to enhance the creative core of the movie. Another requirement for the sequel would be a strong contractual relationship between the production house and the team of Munnabhai. Interplay of all these characteristics would determine the possibility of Munnabhai III and eventually the success of this sequel. Multiple drivers that influence the process of making sequels and their subsequent success have been determined. Firstly, sequel movies are primarily character driven in nature. The genre of the movie and the success of the first movie determine the likelihood of a sequel being made and the response of the audience towards the sequels. Furthermore, a hit index based on box office performance, audience rating and revenue to budget ratio has been formulated. 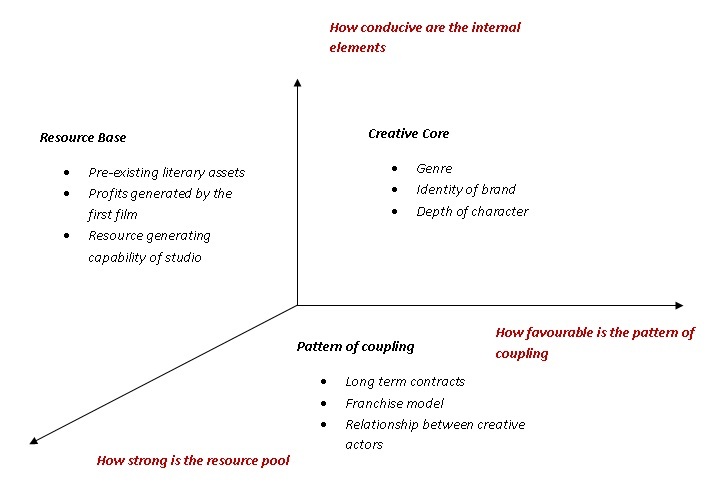 A three-dimensional framework based on the assessment of the creative core, resource pool and pattern of coupling of the movie has been proposed. Finally the idea of sequel making has been extended to Bollywood. While sequel-making is not yet prominent in Bollywood, another model called de-facto sequels have been identified with focus on the character image. An analysis on the likelihood success of a third movie in Munnabhai series indicates high probability of success based on the three-dimensional framework. Sourav Mukherji is an Associate Professor in the department of Organizational Behavior & Human Resources Management at the Indian Institute of Management, Bangalore. He can be reached at souravm@iimb.ernet.in. J. Ramachandran is a Professor in the department of Corporate Strategy and Policy at the Indian Institute of Management, Bangalore. He can be reached at jram@iimb.ernet.in. Aparajita Agarwal (PGP 2008-10) holds an MSc (Technology) degree in Information Systems from Birla Institute of Technology and Science, Pilani. She can be reached at aparajita.agarwal08@iimb.ernet.in. Anshema Gupta (PGP 2008-10) holds a degree in Bachelor in Technology in Electrical Engineering from the Indian Institute of Technology, Kanpur. She can be reached at anshema.gupta08@iimb.ernet.in. To greenlight a project is to approve the production finance so that the movie can move from development phase to pre-production to principal photography phase.